In the last 8 years, Sweden became the economy with the fastest growing income inequality in the industrialized world. Will today’s election reverse that trend? 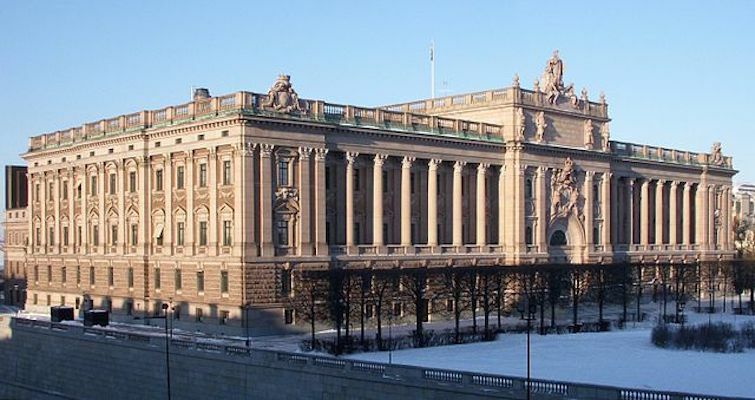 The ruling center-right coalition pursued not just an austerity agenda, like many of their peers (on both sides of the center) across Europe during the recent crisis, but in Sweden they also pursued an aggressive effort to roll back government services and programs and introduce private sector participation in functions traditionally managed by the state. Although some of the policies were introduced in the 1990s, they were ramped up even more in recent years. In particular, Swedish government attempts to privatize and voucherize public education — along the lines promoted by many right-leaning education “reformers” in the United States — devolved into a mess. One recent poll, by Gothenburg University’s SOM Institute (cited by The Guardian article linked above), found that 70% of the country is opposed to the privatization and corporate subsidy schemes of the current center-right government. After 8 years in opposition, the Social Democrats are projected to win the most seats in today’s election and take control of parliament via a left-leaning coalition. Their party leader and likely next prime minister is a former welder and union leader who has never even been elected to parliament before. But the irony is that this win (though slightly better than opinion polls had projected) will come with one of the party’s lowest vote shares of any election held after the 1909 reform that granted male workers the right to vote. Why? Despite the broad-based opposition to the current, right-leaning government’s policy agenda, the opposition has been diffuse and did not benefit one party (such as the Social Democrats) alone. Much of the anger has gone toward the even more leftist parties — such as the Green Party, Left Party, and Feminist Initiative — who will likely join the coalition government with the Social Democrats if they win seats. If any of the outlying left parties don’t meet a minimum 4% vote share threshold — and it appears that Feminist Initiative received less than that — those leftist votes could be tossed out, essentially wasting them, unfortunately. That would be less of a problem if it weren’t for the alarming alternative that might take the seats instead when votes for parties below the threshold are eliminated. With all voting districts tallied by Monday morning, the Social Democrat-led bloc won 43.7 percent of the vote while the ruling centre-right coalition, led by the Moderate Party, gained 39.3 percent. But the anti-immigration far-right Sweden Democrats were celebrating large gains as the party won 12.9 percent of votes cast – more than doubling the 5.7 percent of votes won in the 2010 election. “Sweden friends, party friends, now we’re Sweden’s third-largest party,” party leader Jimmie Akesson told cheering supporters late on Sunday. Neither mainstream party will allow the Swedish Democrats into a coalition government, but with the fragmentation that occurred on the left, and the small size of the non-extreme parties on the right, the Swedish Democrats may hold the balance of power in parliament anyway unless a grand left-right coalition or minority government arrangement is worked out. And that would make no one happy, in light of the rebuke given to the center-right in this election. As we’ve covered before on this site, European mainstream politics right now are facing a very serious challenge from both a splintering but growing far-left as well as a dangerously solidifying, growing, and extreme far-right. Although the far-right Swedish Democrats won their first seats in Sweden’s national parliament back in 2010, they also won 2 seats in the EU parliament this year, amid a continent-wide wave of sometimes extreme populism. That EU vote share in Sweden of almost 10% for the Swedish Democrats helped their momentum going into this national election and boosted them to just under 13%. And also like we saw across most of Europe at the EU elections in May 2014, the Swedish centrist parties and center-right parties were decimated in the results tonight, to the benefit of the far-right as well as an umbrella of parties on the left. The gains by Swedish Democrats are one more demonstration of European apathy and disaffection. The world is very frightening for Europeans now with the economic/currency crisis and the explosive geopolitical context. Moreover, the welfare state is decreasing because of spending cuts. When you mix high unemployment, downgrading the welfare state, and unresolved asylum issues, you have apathy as the result. So between apathy with the system / existing parties and enthusiasm among those seeking easy but dangerous answers, we have the left growing but splitting its votes and the extreme right-wing unifying into a dangerous political force. It’s similar to some of what we have seen in recent years in the United States but is perhaps much more visible in a multi-party system with far higher rates of voter participating (in some cases, mandatory). And as he pointed out, the depth and duration of the economic crunch in Europe, crossed with the resulting cutbacks of government spending and jobs, has put a lot of voters in the mood to vote for anybody but the mainstream parties when they head to the polls. That is the space exploited to allow parties like the Swedish Democrats to make big gains. Tagged 2014 European elections, 2014 Swedish elections, Europe, Islamophobia, populism, Sweden, Swedish Democrats.